EDIT: Giveaway is officially over. Congratulations to the randomly chosen 174th commenter, Tirabaralla! Summer is in full swing! The dance clubs and amusement parks are jamming with people. No lady wants to lug around a full size purse to such bustling places, so Citlalli of Sew Beastly has designed an Itsy Bitsy Wristlet handbag line. These cute bags are the perfect size to fit the essentials and still strap comfortably around a wrist. Each is adorned with a ruffle and outside pocket that closes with a metal snap. Inside has two small open pockets, great for separating cosmetics from cash and phone. 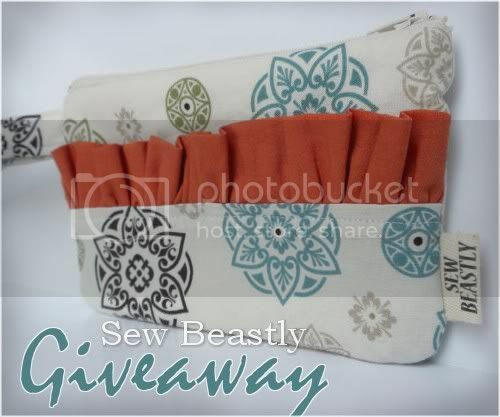 The winner of this handmade giveaway gets to choose one Itsy Bitsy Wristlet, priced at $21, from her new Etsy shop. Citlalli offers a variety of purses, wristlets and pouches. Most of her products are limited editions, made with repurposed fabrics she's saved from being toted away to landfills. She adores working with ruffles, because they bring such life to fabric. She also digs jazzing up designs with gargantuan handsewn flowers. Any of her items can be purchased for 10% off using Etsy coupon code AQUARIANN10 during checkout before August 15, 2011. Giveaway is open worldwide to entrants at least 18 years old. I will be pulling a number from my random.org top hat after 11:59pm EST on July 31, 2011, and the corresponding commenter will win! Citlalli will contact that lucky soul for a mailing address. If she doesn't hear back from the winner within 3 days, a new number will be drawn. Mandatory Entry: Browse the Sew Beastly Etsy shop then comment on this post with your favorite handmade item and a way to contact you, preferably an email or Etsy shop. 1. Like that same item by using the facebook like button on the right sidebar of Citlalli's Etsy listing and leave a comment here with the number of likes to the right of the button. 3. Like the Sew Beastly AND aquariann Art pages on facebook. Liking both counts as one extra entry. 5. Follow the Sew Beastly blog on Google Friend Connect, Networked Blogs or your favorite RSS reader AND my blog on Google Friend Connect, Networked Blogs or your favorite RSS reader for another entry. I love the itsy bitsy wristlet in teal! The Essential Wristlet In Crimson is my favourite. The bright coloured ruffle on neutral black/white is very effective. I have facebook liked my favourite item- mine is the only like so far. I like the The Essential In Summer Fields purse. Please count me in for the contest. I voted for you in the Picket Fence. Will you vote for me too? I love the Callahan Purse In Black Obsidian and I think it would be fantastic in other colors! I just liked the Callahan Purse! I just liked this post! Like this same item on Etsy (FB: jc loh). Currently there is 1 like. I love the essential wristlet in shamrock. LOVE the The Essential In Shamrock Green! I really like the Itsy Bitsy Wristlet In Red Flower Stamps / Limited. I love the callahan purse. I love the essential in shamrock green! I like the The Callahan Purse In Chocolate. I Like the Sew Beastly AND aquariann Art pages on facebook! I like The Essential In Shamrock Green. I love the The Essential In Shamrock Green. I like both of your FB pages (Suzanne Gregg). I love the Itsy Bitsy Wristlet In Off White Scroll! Thanks for the giveaway! I like the Callahan Purse in chocolate. I love The Essential In Sunflower wristlet! Love the Itsy Bitsy & The Essential! You're #23 on Picket Fences now. i follow the sew beastly blog! I like the Itsy Bitsy Wristlet in Red Flower Stamps. I love the Essential Wristlet in Aqua Bay! Liked the Essential Wristlet in Aqua Bay on FB and there's 1 like to it. My favorite is the Callahan purse in chocolate. I like the Itsy Bitsy Wristlet In Teal. I love the itsy bitsy wristlet in red flower stamps! Liked BOTH FB pages. FB name is Cean Lim. Love the mix of color and pattern on the Kiss -N- Make Up Pouch In Coral! I love The Essential In Shamrock Green. I love this wristlet http://www.etsy.com/listing/76997328/itsy-bitsy-wristlet-in-summer-fields ! I love the Essential in Shamrock Green. Thanks for the giveaway! love love love the The Callahan In Summer Fields. Loves the The Essential In Summer Fields wristlets from the shop..so pretty!! I love the The Callahan Purse In Beige, so pretty! I absolutely adore The Essential Wristlet In Crimson . i liked the item ! Love the Kiss -N- Make Up Pouch In Coral / Limited. Liked both the Sew Beastly AND aquariann Art pages on facebook. Realized I didn't put contact info so deleted comment. But looked at Etsy store and my favorite was the Itsy Bitsy Wristlet In Off White Scroll. I love the Itsy Bitsy Wristlet In Off White Scroll. Thanks for the chance to win! I like The Essential In Summer Fields. I absolutely ADORE the 'Callahan' purse in beige and chocolate. I liked both of your pages on Facebook, I am Giovanna V. on FB. I submitted you as a fave on Technocrati, I am Tirabaralla on Technocrati. i voted on picket fence for you today! I love the Kiss -N- Make Up Pouch In Coral / Limited! Definitely adorable! My favorite item is Kiss -N- Make Up Pouch in Sunshine Suit. I'm also following Sew beastly as Ebe. on GFC. I really like The Callahan Purse in all the colors! So cute! I like Itsy Bitsy Wristlet In Off White Scroll / Limited very much! Love the The Callahan Purse In Beige!